Some days you get incredibly lucky. This guy who managed to record a video of a semi-trailer truck almost tipping over and crushing his car just had one of those days. 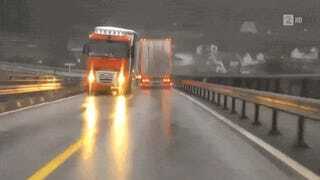 The road was wet, the winds were strong and the truck was about to lose control and fall over. You don't want any of that when you're driving next to said truck. Phew. What a close one.